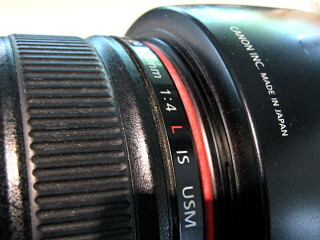 My Canon EF 24-105/4L broke: the red plastic "L-ring" decoration came off. I replaced it with a red elastic band. 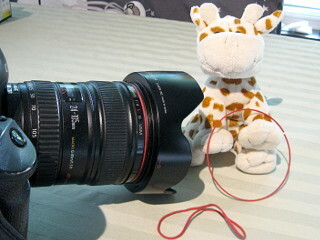 The original ring (I did not lose it) is being held by the furry cow (not an original Canon accessory). A non-OEM spare part is on display in the front. Can you tell which type of ring is on the lens? Here's a close-up. Fits like a glove!